Utilities $99.00 Yes App Store 2018-11-22 PGD Mobile Development S.L. Utilities $99.00 Yes PGD Mobile Development S.L. Now you can scan for nearby WiFi networks, or try to get access to supported routers, and connect to them directly from your WiFi settings window. Start sharing your WiFi Passwords with your community of friends, or job mates or even your clients in your office. 2017 Dictionary for free just following us in twitter! You can find a video tutorial and start sharing your wifi passwords. This year we are celebrating our 8th anniversary, no more dictionaries needed, only for offline mode, and WodSpots for Free! Enjoy the deal! 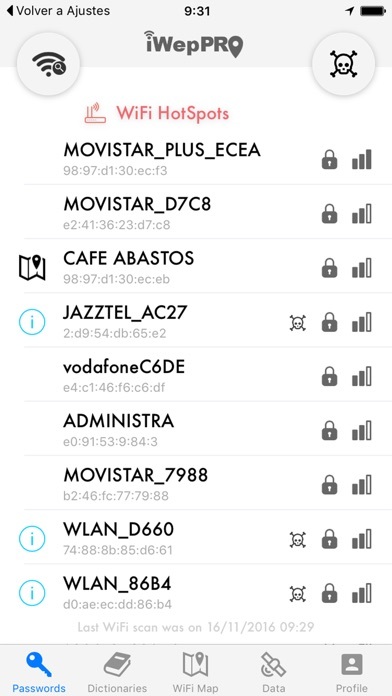 WELLCOME TO #iWepPRO WiFi Passwords We are glad to introduce WodSpots to the community, the first Crowd WiFi Passwords Sharing app that will give you maximum control for your WiFi connections. Since version 4.6 #iWepPRO WiFi Passwords app version brings new Airport and Lounge WiFi Hotspots information. Stay connected wherever you are in every moment. STAY SECURE WITH #iWepPRO WiFi Passwords Have you ever forgotten a password? do you want to keep in mind a lot of passwords for a lot of sites or other stuff? #iWepPRO can remember or generate them all for you and keep them secured behind your Master Password. No new app, but new concept! #iWepPRO will satisfy all the old expectations, and brings a lot of new ones! Every day there are new passwords to remember. They are often forgotten. Using weak passwords or re-using them makes it easy to remember, but criminals love it when you do this. #iWepPRO tries to solve all these problems. - Generate strong, unique passwords for every site, from 1 master passphrase. 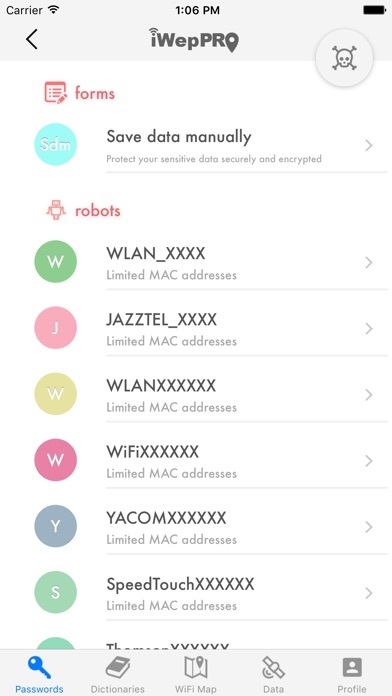 PASSWORDS AND ROBOTS With #iWepPRO WiFi Passwords you can create or calculate passwords for all your needs, you can choose between create a manual record typing your data manually, or you can choose a robot in order to calculate the best password for you. Easy, isn't it? COLLABORATIVE WIFI MAP This is #iWepPRO WiFi Passwords new feature. 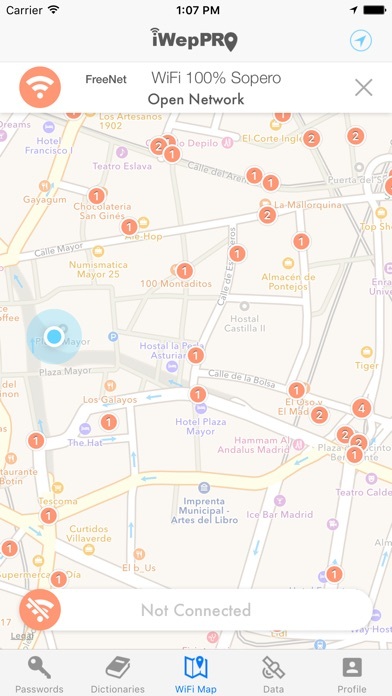 With the Collaborative WiFi Map you will be able to see and share Free WiFi hotspots with other community members. INTRODUCING WODSPOTS What is a WodSpot? We think that every WiFi owner can manage its connection like they want. 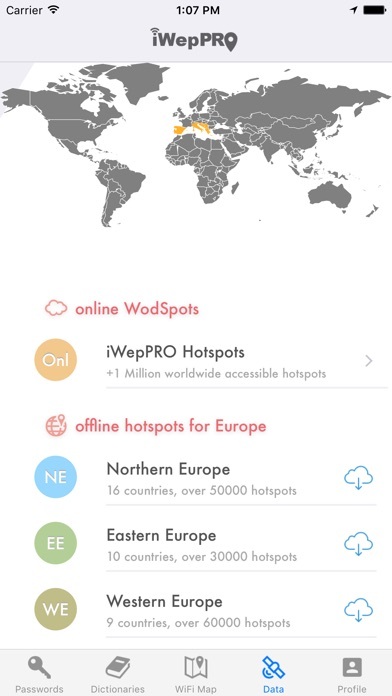 With WodSpots you will be able to manage your internet access and share your WiFi connection with anyone you want. 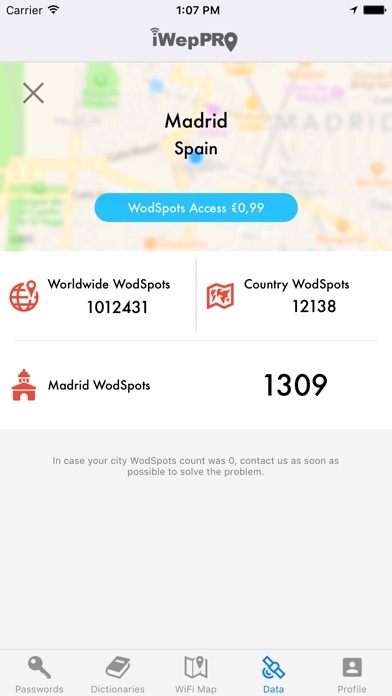 At this moment, you can pay a fix fee to access every WodSpot in your city. But this is a start point, WodSpots will bring much more. 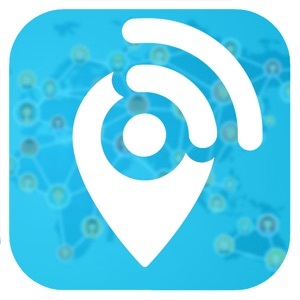 DATA FOR #iWepPRO WiFi Passwords WiFi map at first run is empty, you have to visit 'Data' tab and unlock WodSpots or download the free WiFi hotspots database for your location. You will see a world map where you can select your country and download #iWepPRO database. Disclaimer: "Continued use of GPS running in the background can dramatically decrease battery life."